It has finally landed on the XBox and it's time for another console generation to get addicted to one of the most strangest and wackiest simulations of all time, The Sims! 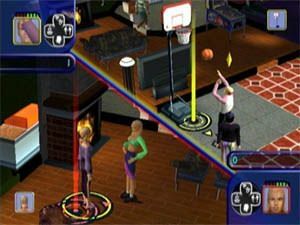 The Sims is the first strategy game based on "real life" that has you doing everything from mundane chores such as cleaning and cooking to inviting friends over and buying luxury items. The console version goes one step beyond the PC version and contains quite a few different gaming modes that include six different multiplayer games, the new and improved "Get a Life" mode and the original PC version of the game. 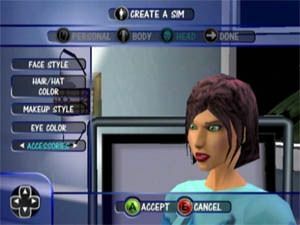 Before starting the game, you must create your own avatar or "Sim" as it's called by the fans and the creators. Everything must be created about for your Sim such as their hairstyle, looks, skin colour, clothes, personality and... ok, I think you get the picture now. The "Get a Life" gaming mode is basically a cleverly designed tutorial game that teaches you the basics of The Sims and has you starting off in your mother's house. Hopefully by moving out of your mother's house, you will soon become that person that you can only dream of becoming, a successful and extremely wealthy millionaire. Ok, it's only a fantasy but it is up to the gamer to make the dreams of their Sim come true. Although this may sound all well and good, you must also monitor certain functions of your Sim. These monitors include your Sims Bladder, Energy, Fun, Hunger, Hygiene and Room bars that all must be maintained in order for your Sim to get anywhere in the world. And yes, I know some of you are asking, if you don't go the toilet, your Sim will wet themselves! Simply put, the world of The Sims is unending and there is virtually a plethora of things you can do in the game, all the spirit of having good fun. The control system of The Sims does take a little time getting use to, especially those who are familiar with the PC version. The PC version used the mouse and keyboard to control your "Sim" in their world but on the XBox, a controller must be used and when they replace the mouse, it does get a little tricky. When I first heard about The Sims being transported into the world of console gaming, I was a little apprehensive because I wondered how on earth will you be able to control your characters. Fortunately, I was pleasantly surprised and Maxis have done a perfect job of transporting the controls from the mouse and keyboard to the XBox controller. And instead of sitting on your computer, you can now sit back in the comfort of your own couch to play this life simulator. You basically control your Sim with the analog sticks on your controller while the buttons are used to give you various attributes and options for your character. Graphically, The Sims isn't the most advanced game on the market but unlike the PC version, the world of The Sims is now a real 3D environment that is not just made up of pixels like the PC version. This 3D engine now allows you to rotate, zoom and do just about anything you like as it's all made up of polygons. Although the graphics are quite simplistic, there is quite a bit of detail and leeway with what you can do in the game. Just about everything in the game has detail, like computers, stereo system or even strip poker tables. You basically start off with a very Spartan home with just the bare necessities and as you progress through the game, you can buy new objects such as a beds, spas, monkey butlers and even renovate your home. The characters are also made up of polygons and although they do look a little too "square", it really suits the atmosphere of this game. The game is also silky smooth on the XBox version of The Sims, unlike the PC version that use to chug and chop every now and then. Musically, The Sims won't win any awards for it's Maxis styled soundtrack that is basically jazz but it does have this happy theme to it. The unfortunate thing about the music is that it is quite catchy and you might find yourself humming one of the many tunes that are in the game. One of the most impressive features about the audio in The Sims is the way the Sims talk and go about their everyday life. The only way I can explain how they talk is that they sound like a very high pitched and fast talking Mr. Bean. Sim talk is extremely amusing, especially if your Sim is having an argument with a relative, friend or partner as they talk in various pitches from high to low, depending on the emotion they are trying to express. Everything in the world of The Sims has sound, whether its the phone ringing, a knock at the door, the sounds of your television or the music on the stereo and quite simply put, it is the sounds of everyday life. 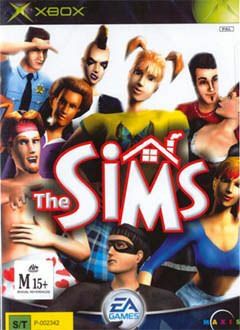 I'm sure The Sims on XBox will find a new breed of addicts and I'm betting that Maxis will release add-ons for this game. The Sims may not be everyone's cup of tea because you can't kill people (well, you can... accidents do happen) in the game and the level of excitement is fairly mellow but I would highly recommend this game to people who have never played The Sims or want something completely different. With simplistic yet colour graphics, amazing sound effects and some relaxing music, The Sims is the perfect game to play on your couch as you can just sit back and relax. Check it out!